NEW DELHI: In a big relief to home buyers, the GST Council on Sunday slashed tax rates on under-construction housing properties to 5 per cent without input tax credit, from the existing 12 per cent, finance minister Arun Jaitley said. 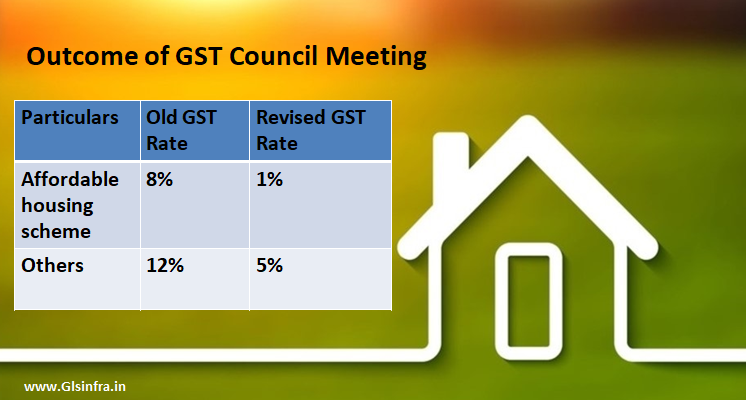 The council also cut GST rates on affordable housing to 1 per cent from the current 8 per cent and expanded the scope of affordable housing to those costing up to Rs 45 lakh and measuring 60 sq metre in metros and 90 sq metre in non-metro cities. The new tax rates will come into effect from April 1, 2019. Currently, the GST is levied at 12 per cent on payments made for under-construction properties or ready-to-move-in flats where completion certificate has not been issued at the time of sale. However, builders will not be able to claim input tax credit (ITC) under the new GST rates. "This (GST reduction) decision will certainly give boost to construction sector," Jaitley told reporters. However, Goods and Services Tax (GST) is not levied on real estate properties for which completion certificate has been issued at the time of sale. With regard to lotteries, the GST Council, however, deferred its decision with Jaitley saying that the Group of Ministers (GoM) will meet again to discuss the proposal. Currently, state run lotteries attract 12 per cent GST, while state-authorised ones attract 28 per cent. Copyrights © 2012-2019 GLS Group. All rights reserved.